Coactive Systems is a collaborative series of projects from Coaction Lab, dedicated to the compulsive exploration of un/stable relationships between organisms, environments and technology. We explore the symbiotic worlds of bio & ecological art, biomimicry, interactive systems, biosensors, multi-sensory data translation; an array of constantly evolving investigations into the myriad collisions of life and technology. 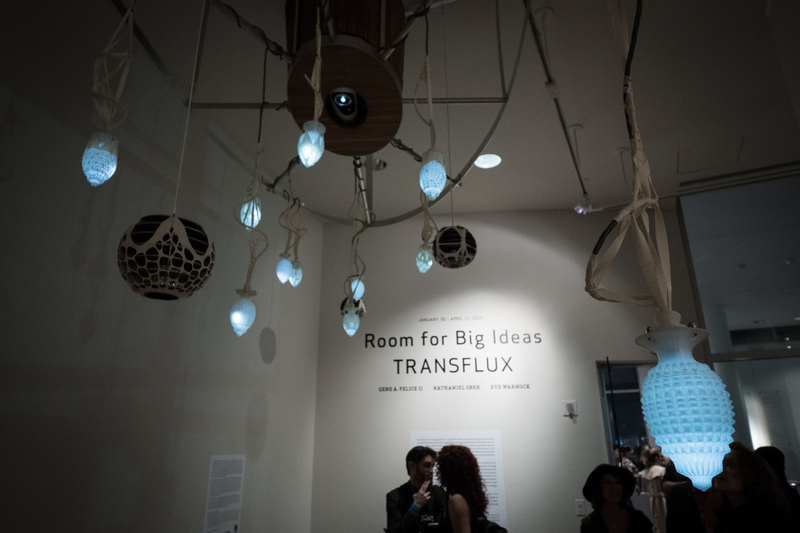 For our show in the Room for Big Ideas at the YBCA, we visited the intersections of macro / micro worlds, where our insides blend with our outsides, where the biological hybridizes with the environmental. This system has two modes, one active / inner and one passive / outer. Passively visitors can perceive a variety of local environmental data captured through CO2, particulate and ambient air temperature sensors or actively, through a series of biosensors translating heart rate, conductivity and respiration. Both input sides of the system are then output / translated through a multisensory installation of light, sound and form.